Autosamplers are replacing manual sampling and injection by automatically selecting a random sample and inserting it into the instrument to analyze. Autosamplers are getting popular as they eliminate sources of error and provide better reproducibility and accuracy, especially in tasks with very low volumes. Autosamplers are widely used in medical labs, in the environmental, pharmaceutical and food industries. Growing healthcare and food industries has significantly augmented the demand for autosamplers in their testing and R&D facilities, owing to which market is witnessing considerable growth. Goldstein Research analyst forecast the global autosamplers market to grow at a CAGR of 8.4% during the period 2016-2024. 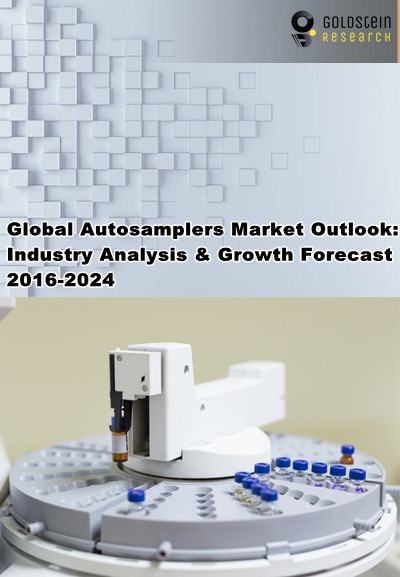 Further, the global autosamplers market is predicted to reach USD 1.4 billion by the end of forecast period. The report covers the present ground scenario and the future growth prospects of the global autosamplers market for 2016-2024 along with the total sales of autosamplers in every region. We calculated the market size and revenue share on the basis of revenue generated from the sales of Auto Sampler to various end user industries across the globe. On the basis of product type, liquid autosamplers accounted for the highest revenue share of more than 65% in global autosamplers market. Moreover, the liquid autosamplers are anticipated to continue its dominance with a CAGR of 7.8% over the forecast period. Global Auto Sampler Market Outlook 2016-2024, has been prepared based on an in-depth market analysis from industry experts. The report covers the competitive landscape and current position of major players in the global autosamplers market. The report also includes porter’s five force model, SWOT analysis, company profiling, business strategies of market players and their business models. Global autosamplers market report also recognizes value chain analysis to understand the cost differentiation to provide competitive advantage to the existing and new entry players. Our global autosamplers market report comprises of the following companies as the key players in the global autosamplers market: Agilent, Bio-Rad, Falcon, Ge Healthcare, Gilson, HTA Srl, Jasco, Leco, Merck, Perkinelmer, Restek, Scion, Shimadzu, Thermo Fisher, Aqualabo Group and McLane Research Laboratories. According to our global Auto Sampler market study on the basis of extensive primary and secondary research, one of the major trend that driving the growth of autosamplers market is stringent regulations in pharmaceutical and food industry which requires high standard of quality product and medicines. Food and Drug industry need to test their product quality at regular intervals, which significantly augmented the demand for autosamplers in respective industry’s R&D facilities. According to the report, major driver in global autosamplers market is huge growth in food and beverage industry. In the world of stringent norms for production quality and to ensure longer shelf life of the product, autosamplers plays an important role to measure the threats including microbial and chemical contamination. Market players are providing specially tailored products for the food industry customers to expand their business across the industry. Further, the report states that one challenge in global auto sampler market is high cost of autosamplers. An upfront investment of several thousand dollars is commonly required to begin a project. However, much of the investment made by the consumer can be recovered by reduced labor cost. Geographically, Asia Pacific region dominated the global autosamplers market, with more than 28% revenue share in global market owing to huge healthcare and food industry in the region. Asia Pacific region is closely followed by the North America with market size of USD 190.0 million in 2016, which is expected to grow at a CAGR of 8.0% over the forecast period.